6Metre day at Clapham on 16th September. Five of us turned up for 6Metre racing on a fine day, but very windy!. One of the five was our new member, John who sailed Derek,s second boat so we had five boats on the water. The wind was strong and we had boisterous sailing, the boats being hard pressed sometimes. Jim with his Seismic won most of the races, the boat going very well in the strong winds. Ted did well, coming second in several races, while John also did well in only his second outing with a 6m boat. Alan was in the middle of the fleet most of the time, while Derek, after a poor start, did better after a bit of tuning, scoring several seconds and thirds in the second half of the meeting. A good days sailing in spite of the strong winds. Club members please note that the Vinyage Club will be at the pond on the 30th September. 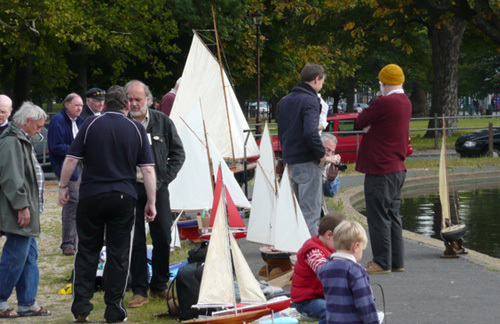 Those of our own Club who go on the 30th will take the opportunity to sail the Solings. Hope to see you there on the 30th to support the Vintage Club. Derek.